Back in 2012, over at dVerse, Gay Cannon asked ‘What is modern?’ and also asked us to write a Triversen poem—I guess we all have our own take on what is modern—it seems to me to be a word that is used in many different ways…anyway, here is my Triversen poem, the form was invented by William Carlos Williams. Over at dVerse Poets, Gay had us writing Triversen in 2012—it’s harder than it looks—go and see for yourself! Republished in 2015 for Grace’s prompt about springtime. Categories: Writings & Witterings | Tags: 2012, 2015, Arts, dverse, lamb, Literature, poetry, Polly Stretton, Triversen poem form | Permalink. Lovely visual that brought to mind an 8-day retreat I spent at a monastery in a countryside in Pennsylvania in many years ago. The ewes were dropping their babies and every time you looked there were more little white dots on the green grass. I’m smiling. Very effective use of the form – the implied “agnus dei” lamb of god – the Easter message of joy in resurrection, in new birth, the hope of salvation, the turn of the seasons, and cycle of life – all this is found here. It flows so naturally. The poem lies before us green, scintillating in new light. This is a very successful poem. Kudos. Thank you for your comments, Gay, and for a superb prompt. Second time around I felt the naturalness of the symbolism – which goes beyond faith and redemption but right to life itself. Again, as I say a very successful poem and exquisitely beautiful. nice…so cool to see new life born…it reminds us of the miracles that are life around us…lovely imagery in this as well.. I could wax lyrical about. This wasn’t easy, was it? The lambs around us are getting big and run around in gangs at the minute. hah! Aprille, ‘ignominious’ is a wonderful word, I’ve been wanting to use it and it came to me for this poem, I’m sure! This is one christening I wold love to see–I mean, I see it in images, and now would like to be transported there. I like the idea of the sun (she) delighting in rebirth! mmm … all that sunlight, I guess. Always a joy to see a naturalistic poem, as so few writers are adept at it, choosing instead an urban vocabulary. Love lambs in literature. Like the visual. Great work here. You’re not on your own Henry 🙂 Thanks for commenting. Beautifully vivid write, Polly. I could see it all in glorious living color! Thanks for your thoughts, Charles. I’m glad you showcased this one. Have you thought of submitting it for publication somewhere? I’m fond of this one, Laurie, but fear I wouldn’t have a clue about where to submit it for publication. I’ve had some poems published in anthologies, so may wait for the next appropriate one of those … I don’t know enough about submitting work / protecting copyright / whether publishers accept blogged work etc, so now I’ve written that perhaps it will make me do something about it. I’m glad you’re open to the idea, Polly. My email is lkkolpbmt@yahoo.com. Maybe I can help. 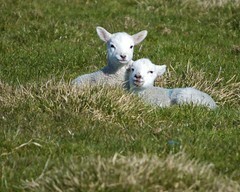 Lovely… Lambs bring me joy. Thank you for this piece. Cheerful little critters, they are wondrous. Makes one feel better, somehow. Lovely Polly – well done. As usual I have come to the dVerse challenge too late, but am going to have a go at this form. Vivid, and with a soft emotional edge of rebirth,refreshment and the connection with renewal that the web of nature provides us–liked it much. It’s all been said…. Apart from. An interesting twist and a nice commentary about what constitutes the modern, we tend to be blind to those things outside our narrow conception. It’s great to see form and your conceit working together well. Not to be disrespectful of form, rhyme, meter, etc. I pay attention to what is said and how, rather than the former. I could smell and see everything you write here. There is strong sense of renewal you put forth beautifully. Thank you. Thank you for your honesty, I like the words and the way in which they’re used, what is said and how … having said that, sometimes they can be even more effective, tightened somehow, by the constraints / freedom brought about by a particular form. This is wonderful. i know little of form, but this definitely brought William Carlos Williams to mind. Gorgeous imagery. Wish the babies would wait for a warm day around here… no thunderstorms in February are their time of choice. Such a pretty poem. Really almost an Easter kind of poem, I thought. Though very naturalistic too, one can feel the stumbling of just-born feet. Thanks also for all your kindness, Polly. k.
Reblogged this on Amanda Sanders Summary. Wonderful Polly, There is nothing that is more spring to me than a newborn lamb…. A wonderful poem filled with the new life of spring – serendipitously, just got a call from my husband driving to a clients home, he saw twin lambs in the field, newly born, is turning around now to stop and photograph! Polly, I have to laugh… I saw the single word in the title and thought for a moment that the poem was going to be about Lamb, the dish… not Lamb, the animal!! And I was filled with dread, because I love those curly little guys and hate to see them end up on a plate. Pleased to see your fears were so quickly allayed! how cute! a lovely write.